Let your soil eat local for Earth Day – Gardeners are invited to purchase locally collected and cured compost from Island Grown Initiative. IGI’s chemical-free black-gold is made from leaves, grass, local manure and Island food waste collected by Island Food Rescue. Compost is sold in 40 lb. bags for $12.95 or loaded by the yard into a pick-up truck for $60/yard. 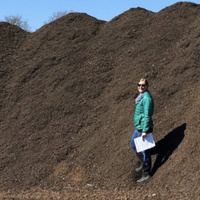 This compost represents the first harvest of Island Food Rescue which began collecting food waste from Island ­­­­­­­restaurants in 2016 and transfer stations last summer. The program has grown to include over 30 restaurants, Cronig’s Market and all island schools. Island residents and visitors can participate by picking up a free countertop compost bucket, filling it with food waste and delivering it to the food waste receptacles at the Edgartown, Oak Bluffs, West Tisbury and Chilmark transfer stations. Buckets are available free of charge at these transfer stations as well as Thimble Farm and each bucket is $2 to dump.